Originally a fork of Mambo, Joomla has grown into the second most popular Content Management System (CMS) on the web behind WordPress. In January 2012 Joomla was upgraded from 1.7 to version 2.5. It brought a lot of great new features such as notifications for easier updates, multi database support and improved search functionality. Today we would like to show you a collection of 30 beautiful Joomla templates that showcase what this powerful and popular script can do. A stylish template that comes with 6 preset styles, 78 module positions and 58 module variations. It also includes a colour chooser and a background slideshow option. The drop down navigation menu at the top of the page looks beautiful and it includes a lot of pre defined typography settings build in (most of which can be used using shortcodes). Ionosphere is a versatile template that comes with 12 colour schemes. It has a whopping 84 module positions and support for viewing on iPhones and Android devices. 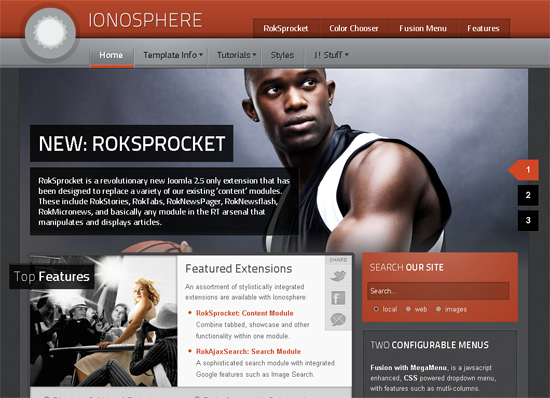 RocketTheme exclusives such as the Fusion Menu and RokSprocket extension for styling are also included. Another versatile theme from RocketTheme that comes with a colour chooser, 12 colour schemes and 68 module positions to choose from. 16 unique RocketTheme extensions are also included such as the comment extension RokComments, content rotator RokNewsFlash and Twitter module RokTwittie. 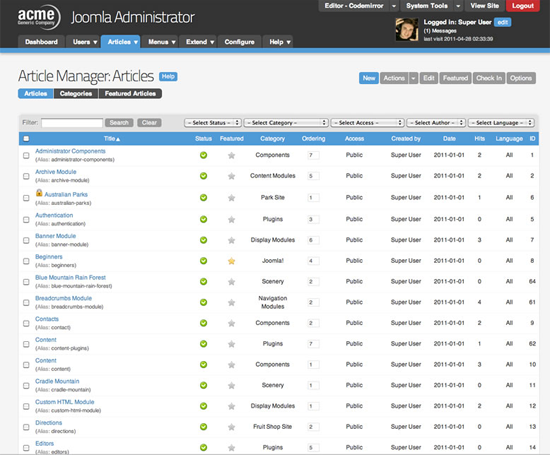 A free admin template that was developed for Joomla 2.5 to make administrating a Joomla website more user friendly. It’s fast loading and has features such as custom logo uploading, user statistics and an editor switcher. A beautiful dark blog template that has portfolio options for showcasing your work. A light version of the theme is also included and support for 3rd party extensions such as the K2 component and News Show Pro. 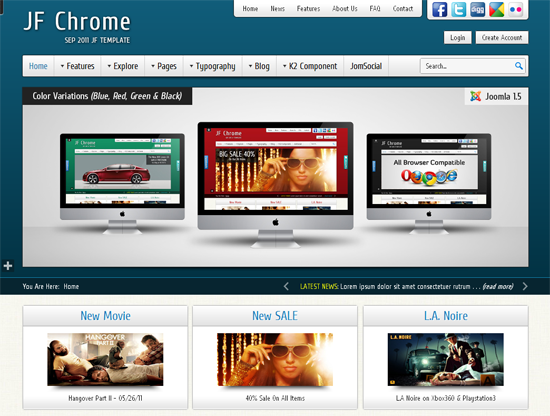 Designed for multimedia topics like gaming, movies and music. 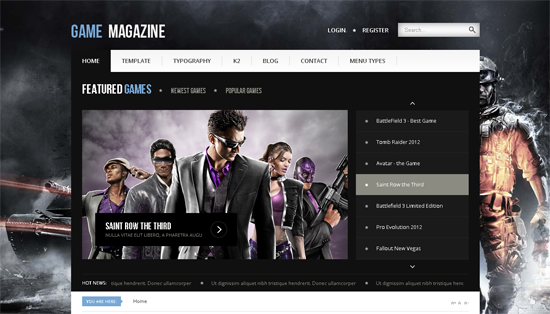 Game Magazine has a great looking home page slider that can show featured, recent and popular posts. It works with a lot of 3rd party extensions and has beautiful typography as well. 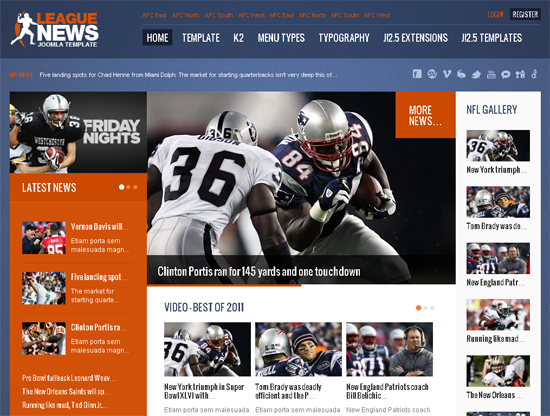 A professional looking news portal that was created for sports websites. Developed using HTML5 and the latest Gavern Framework, League News is arguably the best magazine style design available for Joomla at the moment. It includes a news rotator, support for many popular extensions and great social media integration. 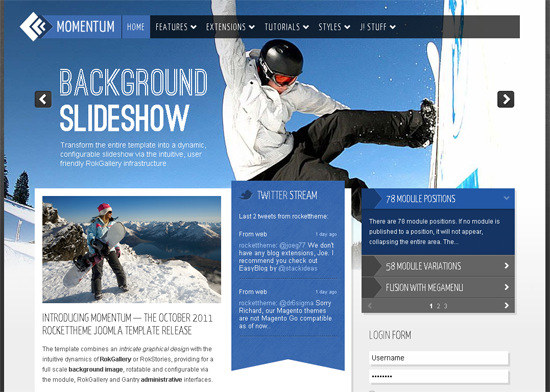 A business style Joomla template that can display content in 1, 2 or 3 columns. There are 17 module positions and 16 advertising positions to choose from and it comes with 5 colour schemes. 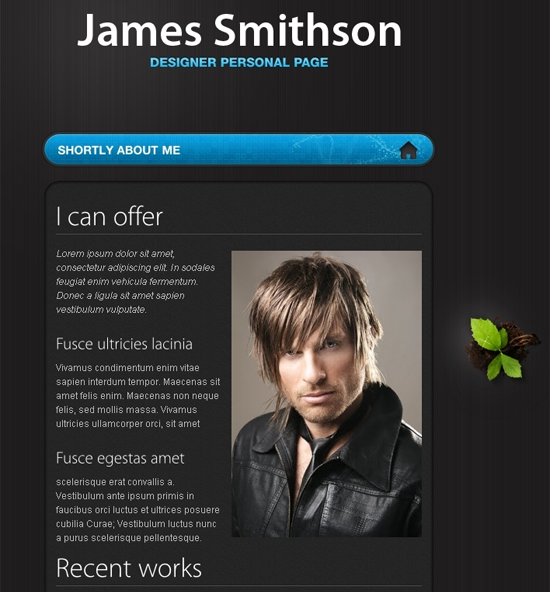 Fixed and fluid layouts can be used and a layered Photoshop PSD file is included with the template too. 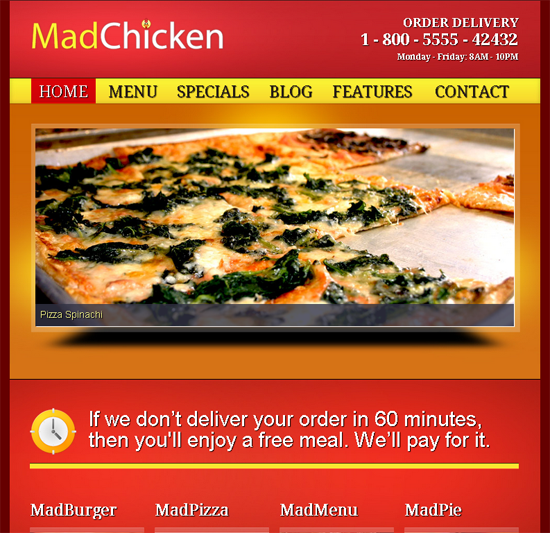 Designed for fast food businesses, Mad Chicken is a simple design that was setup to promote your menu. It comes with two colour schemes: red, orange and yellow and red, green and light brown. Powered by the Gantry Framework, the same framework that is used to power all RocketTheme designs, it includes a colour picker for choosing theme colours and has support for the iPhone and Android devices. A corporate design that comes with 5 pre-defined colour schemes. The home page features a great looking featured slider and content can be displayed using portfolio, gallery and blog templates. It works with JoomShopping Cart so it can be used to build an online store too. 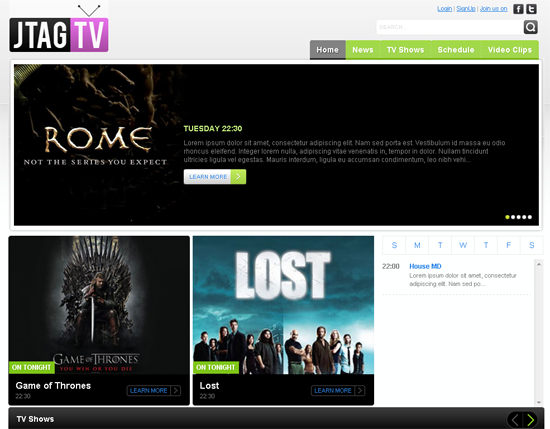 JTAG TV was designed specifically for movie, video and TV websites and blogs. It works with most video services such as YouTube and Vimeo and includes the latest clips video slider. 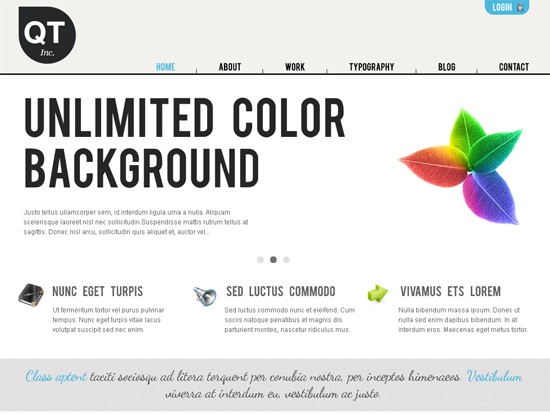 A one page template design that comes with 12 colour schemes and a fixed or fluid layout. Designed using the Wright Framework, Transitions between different sections are smooth and the typography used in the design is beautiful. A versatile Joomla template that comes with 6 colour schemes. The design is clean and professional looking with box images used throughout the design to promote pages and posts. A business design that uses a 960 grid layout. There are 12 module positions to choose from and you can use 1, 2 or 3 column layouts to display your content. 10 colour schemes are included though only the header and link colours are different in each skin. 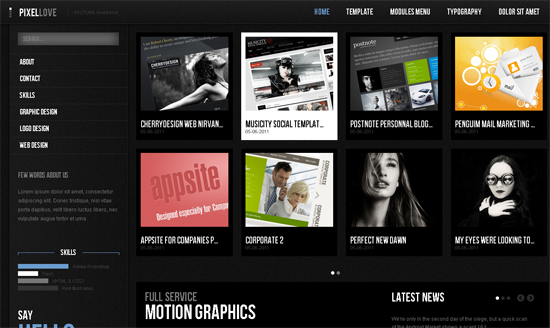 A professional corporate style that has a great featured post slider on the home page and 14 module positions. 4 colour schemes are included and it has a cool drop down navigation menu at the top of each page. A beautiful clean responsive Joomla template that changes the number of posts displayed depending on width of the browser being used. The transition from 2 to 3 to 4 columns is smooth and when a visitor hovers over a post the other post images on the page fade to highlight the post being selected. 8 colour schemes are included as well as a slideshow module and portfolio template. 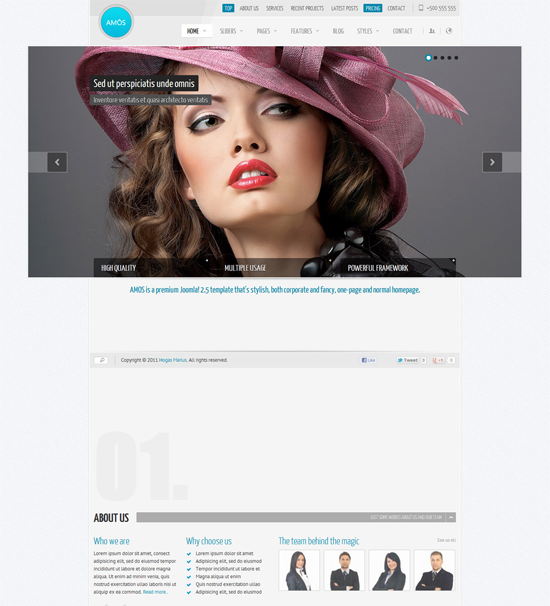 A clean minimal Joomla template that is suitable for business, blogs and portfolio websites. 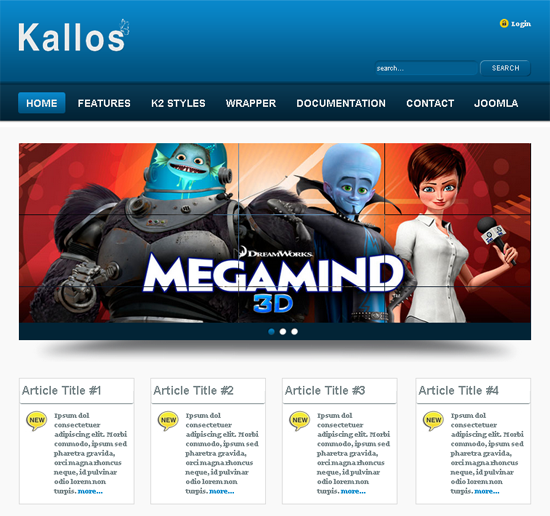 The home page features a large featured slider that has 27 animation styles. 7 colour schemes are available and there is a built in testimonial template too. A feature rich Gantry Framework powered design that has 11 different types of home page sliders and 65 module positions to choose from. 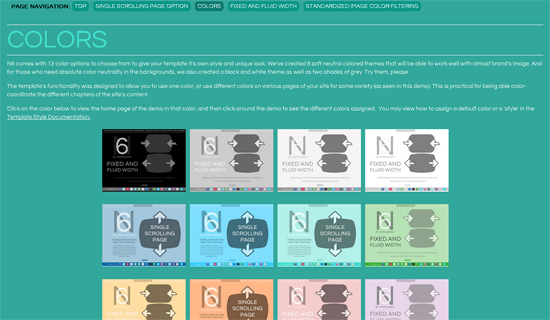 Google web fonts are supported and there are 4 colour schemes included with the template. Alternatively, theme colours can be changed using the colour chooser. An elegant template that comes with a number of different dark and light skins (16 variations in total). 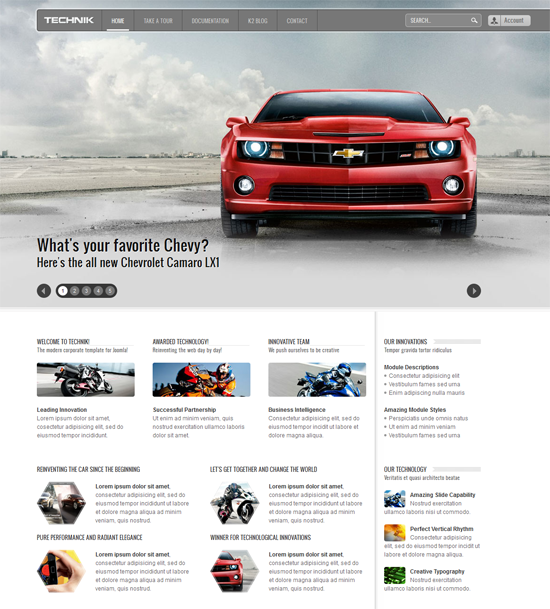 4 different home page layouts are included together with a testimonials template. 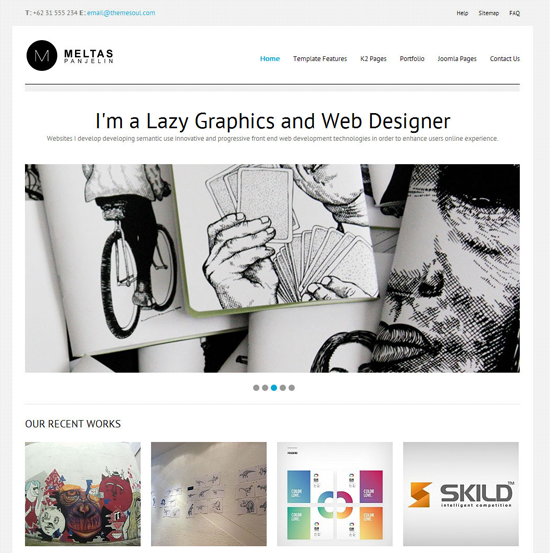 A good choice for a business website, blog or portfolio. A creative corporate design that comes with 50 colour variations. The colour variations are quite small though with the dark colour scheme retained at the top of the design and the content area changing colours. There are 11 different versions of the slide that is displayed on the home page (on an iMac no less!) 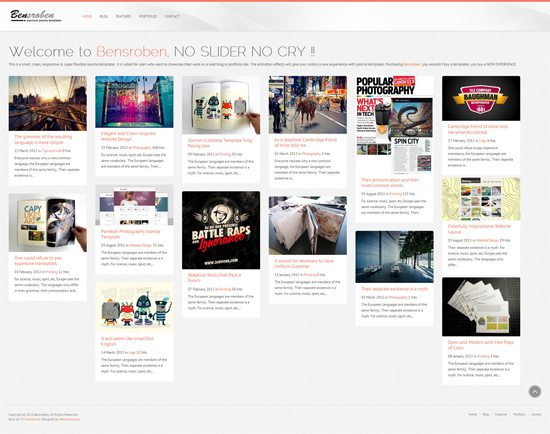 and one or two sidebars can be used on content pages. A simple yet stylish personal Joomla template that was created for resumes and simple information websites. 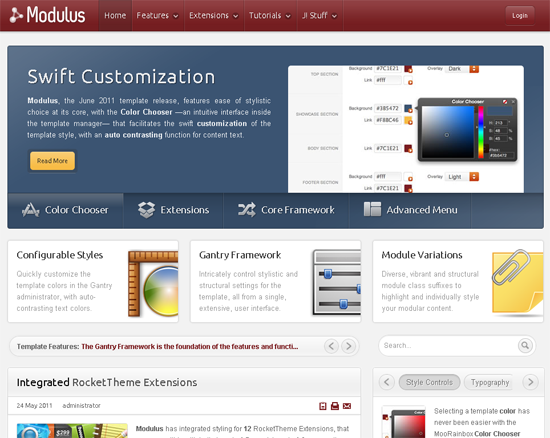 Despite the simplicity of the template, it offers 67 different module positions and 36 different layout combinations. JF Chrome is a flexible Joomla template that could be used for businesses, blogs, portfolios and communities. 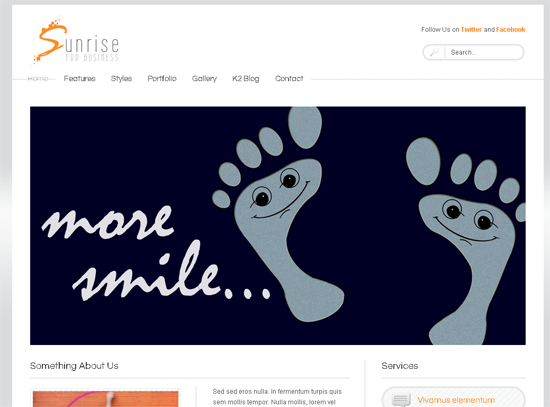 There are two different versions of the beautiful home page slider available, 4 colour variations and 4 menu options. 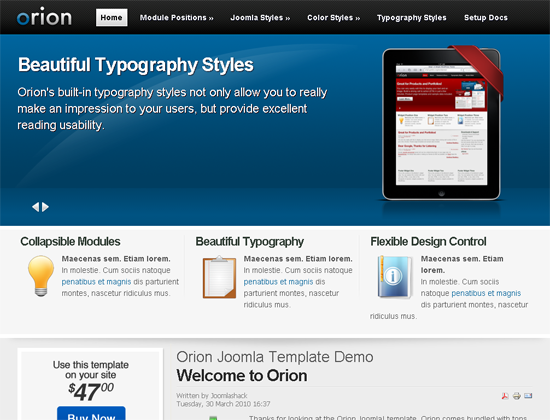 It supports Google fonts too and comes with 40 module positions, a pricing table and custom error pages. 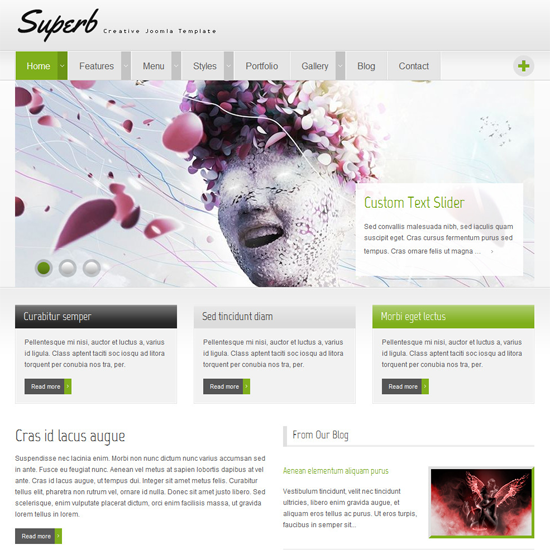 Superb is a creative Joomla template that comes with 16 colour schemes (8 variations of light and dark). 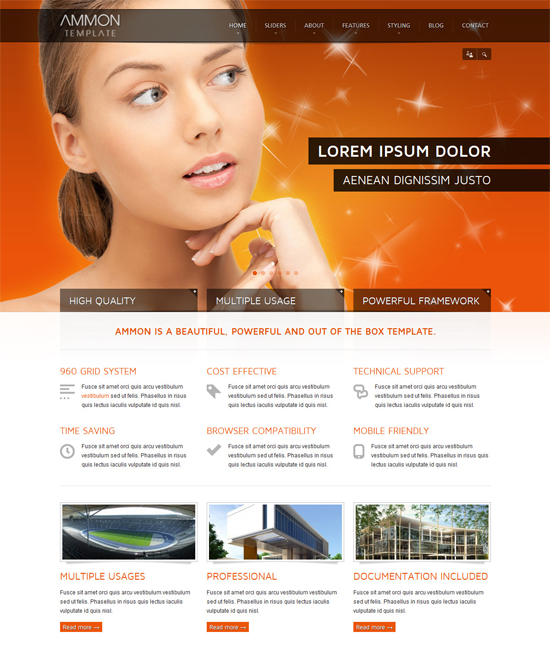 It comes with a beautiful blog template, a 1, 2 or 3 column portfolio template and a 2, 3 or 4 column gallery template. 3 different home page layouts can also be chosen with each layout showing a different sized feature slider. A clean professional looking template that could be used for any kind of website. One of the themes biggest selling points is its 12 different sliders. These allow you to use rotating image backgrounds, a nivo slider or even a video background. The theme has 70 different module positions and numerous page templates including a blog template, portfolio template, photo gallery and FAQ template. Google fonts are supported as well and there are lots of shortcodes for styling content. 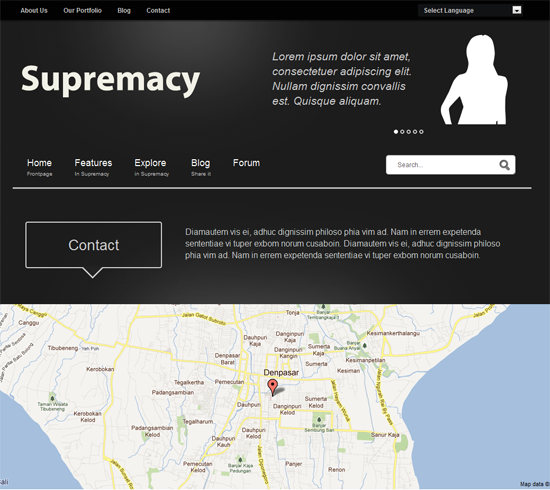 You need to check out the theme demo to appreciate the quality of this template. 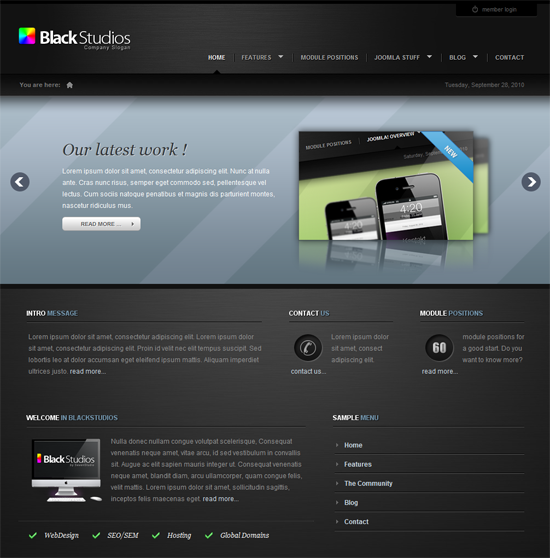 BlackStudios is a dark and clean corporate design that comes with 5 colour variations. It has support for Google fonts, looks great on mobile devices and there are over 60 module positions to choose from. A futuristic design that uses an impressive slider on the home page and a smooth drop down navigation menu at the top of the page. It has support for Facebook comments and has great typography for styling your content. AMOS is a versatile design that lets you use a one page scrolling template for the home page or a regular home page that links to sections as different pages. It includes 7 different sliders, 60 different module positions, 2 different portfolio layouts and lots of unique templates and shortcodes for styling content. A clean business template that features a nivo slider on the home page. It comes with a light and dark skin though colours can be customised how you want using the theme style editor. 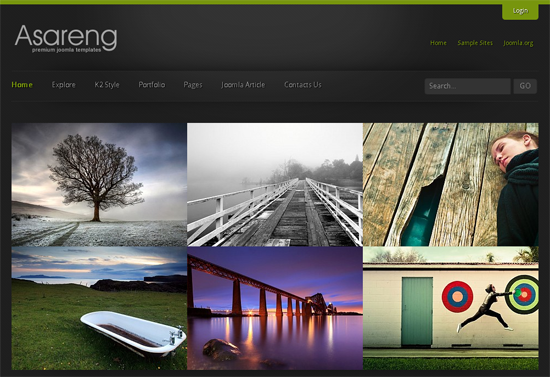 Portfolio, gallery and blog templates are also included with the template. 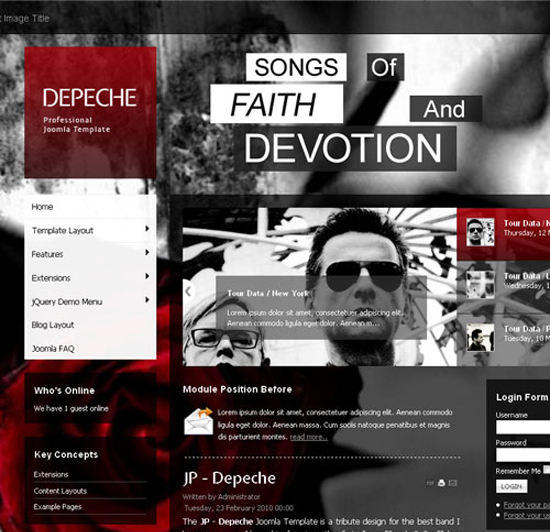 Named after the British band Depeche Mode, Depeche is a grungy design that is perfect for blogs. 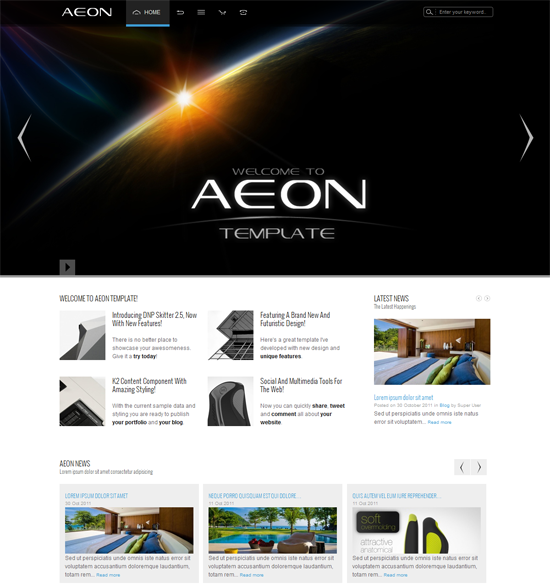 It includes a regular slider, full page slider and article slider and the tableless design allows modules to be collapsed. We hope you have enjoyed this list of professional Joomla templates. As always, if your favourite design didn’t make the list, please feel free to share it in the comment section. Thanks for the collection! I like the “Momentum” template. Thanks for the nice collection of Joomla templates. And if you want to create your own responsive template for Joomla 2.5, you can use the Blank Template under http://blank.vc to start. You should have considered adding Yootheme in this collection, particularly off late they have added some really neat templates with effects that at least I have not seen in any other Joomla offering. Nonetheless a nice collection. Hey Kevin, really a great post. I liked the “James”. Please keep posting some non-commercial type templates. Thanks.